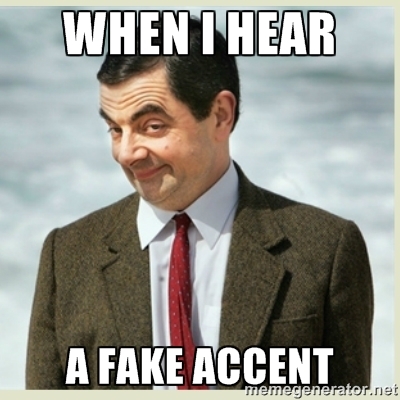 In fact, to call the accents I heard on airport announcements—and on FM radios—inept affectations of a hybridized Anglo-American accent is to undeservedly humor them. I know most people who travel through Nigerian international airports—and listen to Nigerian FM stations— know what I am talking about. The accents are neither American nor British. Nor are they, for that matter, Nigerian—or anything; they are just abominably inaudible babbles that mindlessly grate on the hearer’s auditory sensibilities with their exaggerated but spectacularly incongruous nasalization of every sound. I would have rolled on the floor laughing (to use Internet lingo) if I wasn’t insanely incensed at my own inability to make out “Kano” from “Cairo” from the announcer’s voice. Yes, it was that bad: Cairo and Kano sounded exactly alike in the announcer’s nasalized babble. I would have missed my flight to Kano if I didn’t trust my instincts to go ask a group of resplendently babbar riga-attired gentlemen in a queue if they were going to Kano. Of course, the pilot’s announcement welcoming us to the “plight” to Kano assured me that I was indeed on the right plane and that my plight with the airport announcer with tediously fake and exaggeratedly nasalized accent was over—at least for that day. I talked about this issue with several people at the airport who told me barely audible, affected airport announcers’ accents are becoming a desperate menace. Someone even jokingly called it “a grave national security threat.” But this isn’t a joke. I heard stories of Nigerians and foreigners alike who missed their flights because they couldn’t figure out what the announcers were saying. And since passengers can neither see the announcers physically to seek clarification nor have access to even a basic digital airport signage that shows flight itinerary, they are often condemned to the tyranny of the pretentious but incomprehensible accents of illiterate airport announcers. There is one other important reason why the Nigerian airport announcers’ accents are irksome: they don’t represent the range of accents in Nigeria. There are at least three types of accents in Nigeria. At the top of the totem pole of Nigerian accents is what I call imported but authentic foreign accents. 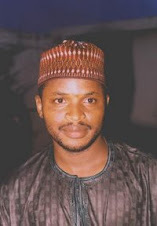 These are the accents of foreign-born (or foreign-educated) Nigerians in Nigeria (such as the crisp British accents of former House of Representatives speaker Oladimeji Bankole, Minister of Environment Amina Mohammed, human rights activists Ayo Obe and Ayesha Imam; the American accent of former NAPEP coordinator Magnus Kpakol, etc.). You also have what I call the Nigerian broadcasters’ accent, fully realized in the mellifluous, articulate accents of broadcasters like Cyril Stober, Kalu Otisi, Yusuf Aliyu Addy, Eugenia Abu, Ruth Opia, etc. And then there is what I call demotic Nigerian English accent, which has regional variations. A September 18, 2014 CNN article that identified Nigerian English accent as the world’s 6th “sexiest accent,” obviously prefers demotic Nigerian English accents to the first two because it chose the accents represented by King Sunny Ade and Omotola Jalade Ekeinde as its examples of “famous tongues” in Nigerian English accent. “Dignified, with just a hint of willful naivete, the deep, rich ‘oh's’ and ‘eh's’ of Naija bend the English language without breaking it, arousing tremors in places other languages can't reach,” the article said. The way I involuntarily switch to an American accent when I speak to Americans is the way I automatically switch back to my “natural” Nigerian accent when I speak to Nigerians, except that these days, because of many years of continuous stay in the US, it’s becoming hard for me to remain non-rhotic, as linguistics call the act of not pronouncing one’s “r’s.” Americans and Canadians are rhotic because they pronounce their “r” wherever it appears in a word. Nonetheless, each time a Nigerian tries to speak to me in a foreign accent and I sense that their accent is affected, I have a hard time keeping a straight face and speaking back to them in a foreign accent. I recall an encounter with a US-based Nigerian professor when I visited Nigeria some 5 years ago. A mutual friend introduced us and pointed out that we were both American university teachers. Then the man started speaking to me in a ridiculously affected American accent. I felt like saying, “We are in our country, my brother; why can’t we speak like Nigerians at least while we are here.” Of course, that would have been rude. So what did I do? I just switched to Pidgin English. It threw the man off. No Nigerian can speak Nigerian Pidgin English with an American or British accent and not sound ridiculous even to himself! I am saying all this to point out that this new trend to affect foreign accents in places that attract Westerners is just plain dumb. It is dumb because everyone who travels to another country prepares him or herself to hear the accents of the people of that country. They don’t expect to hear accents they are used to at home. (I traveled to Paris recently and the airport announcers and members of the cabin crew on Air France spoke English with an unapologetically French accent). 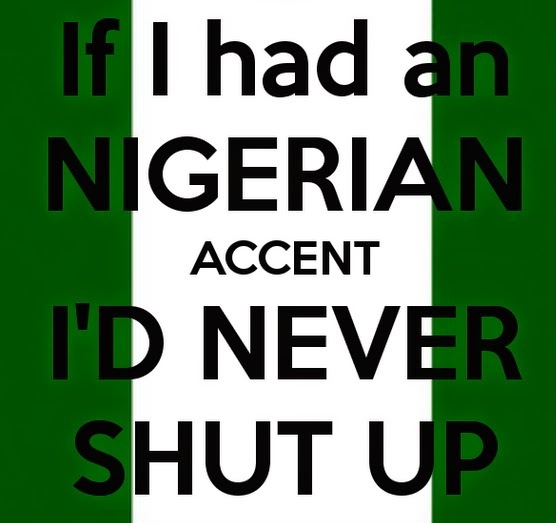 It is also dumb because neither Nigerians nor foreigners understand the affected accents, so it is wasted effort.